On occasion of the Columbus Day Celebration, and on Silvio Medoro’s initiative, a Medieval dinner event was organized to provide reconstruction support funding for the town of Capodacqua di Arquata del Tronto devastated during the recent earthquake in Italy. Thank you to chefs Dan Vernia and Silvio Medoro for the wonderful dinner! On the website www.capodacquaviva.it you can find information about what the purpose of the Associazione, who are its members, and what activities it carries out. The mission of the Associazione is to facilitate humanitarian activities in favor of those populations affected by public calamities or other extraordinary events; promote and implement necessary initiatives to return to normality of populations affected by earthquakes and natural disasters, ensuring them every type of aid and assistance possible, including through the provision of goods and services, as well as to ensure in particular: Social-health care, charity, support for education and k-12, university, and graduate education in favor of orphans, of the members victims’ families and those otherwise affected in the earthquake or natural disaster; Economic and occupational recovery of the craft, commercial, professional and agricultural activities suspended or interrupted as a result of such disasters. I fondi raccolti durante e dopo l’evento del 12 ottobre 2016, organizzato in collaborazione con Silvio Medoro (Silvio’s Organic Pizza, Ann Arbor, MI) sono stati trasferiti all’ Associazione Capodacqua Viva per progetti di recupero architettonico, culturale e aggregativo”. 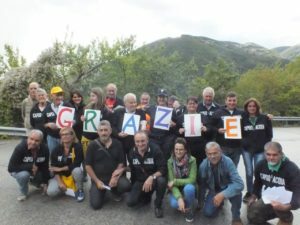 Sul sito dell’Associazione www.capodacquaviva.it è possibile trovare tutte le informazioni su cosa fa l’associazione, da chi è composta e quali sono le attività. la ripresa economica ed occupazionale delle attività artigianali, commerciali, professionali ed agricole sospese o interrotte in conseguenza delle calamità. You can sill make your 100% donation to support Capodacqua di Arquata del Tronto.